1) Social Media Promotion – use your twitter and facebook pages to help promote other blogs. Make a goal today — use half of your social media posts to help promote others. Retweet your fave bloggers! Share their facebook posts! It is easy and should only take you a few minutes. While you are on twitter, if you see something from another blogger you love, hit that retweet button and show her some love! Maybe you are on facebook? There is a share button right under the posts on your home page. Spread the love! 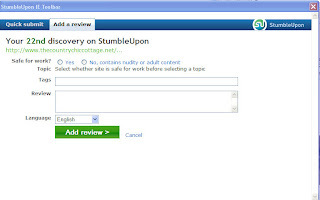 2) Stumble Upon – have you all tried Stumble Upon yet? You can install a toolbar right in your internet browser window. See a post you like on another blog? Just hit “I like it!” in your toolbar. If it is the first time that page has been stumbled, you will have to fill in a few tidbits of info (see screen shot below). It is quick and easy. The benefit? Stumble Upon drives a ton of traffic. This is a great way to send your favorite blog some extra hits! 3) Pinterest – the blogging world is all a buzz about Pinterest lately. 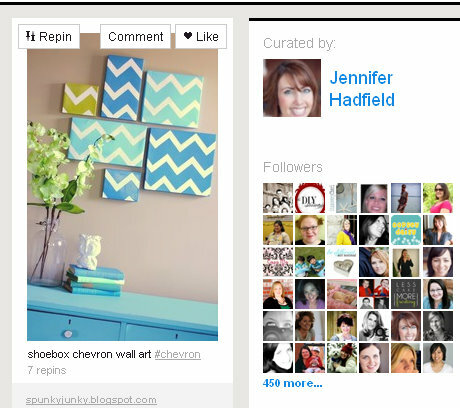 Pinterest is a great place to highlight your favorite posts or things you might want to refer back to later. You can have different “pin boards” to organize your favorites. How does this help promote other blogs? If you pin you fave pictures on other blogs, the people that follow your pins and look at your pin boards will see those pictures. They can “re-pin” those ideas or click over and visit the blog! Pinterest is very quick and easy to use. Hop on that bandwagon today! 4) Have a Guest – allow some guest posts on your blog. You can do “blog swaps” where you post on their blog and they post on yours. Or “guest posts” where they only post on your blog. Guest posting or blog swapping is a great way to promote other bloggers and get some promotion yourself. Establish the rules — are you looking for original content? Blog highlights? What are your rules for the person that will be posting on your blog? Write up those rules and be sure they are agreed to by your guests. Establishing the rules will help you NOT be disappointed by a guest post that is not what you are looking for on your blog. Will you allow guest posting only on a certain day or the week? Only one day a month? Maybe you will host an entire series of guest posters. Come up with a plan that works for you. Will you publically promote the fact that you accept guests? Or will it only be open to a few select people you invite? Decide how you want to handle this now before the requests come in. Once you have one guest post on your blog, you may very well get requests from others interested. Thinking of these things ahead of time will help you be consistent in your responses. 5) Ad swaps or giveaways – we would all want an ad on our favorite blog right? Consider keeping a slot or two on your sidebar open for free ads. You can do a monthly ad swap with another blog or host a giveaway every month where the winner gets a sidebar ad. Great promotion for another blog and FREE for you! Hosting a giveaway like this on twitter or facebook is another great option! 6) Spread the Blog Button Love – have a page on your blog or a space on your sidebar dedicated to the blogs you love. 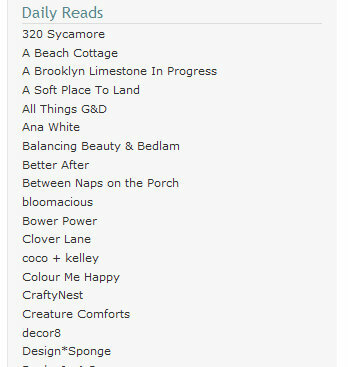 It is a great feeling to see your blog under one of these headings. Spread the love and add this to your blog today! A page with all the blog buttons of your faves or just a simple text link list in your sidebar. I guarantee you will make someone’s day! I also highly recommend a page or space where you link those that have featured you. A little thank you for those features, plus it gives the blog that featured you some well deserved promotion. 7) Top Referrers – promote those that promote you. Occasionally give a little love to your top referrers. You can find your top referrers in whatever analytic program you are using. Link to them in a monthly or quarterly post giving them a huge THANK YOU! Or you can dedicate a place in your sidebar to them (see screen shot below). After all, they are in some way helping to promote you — promote them in return. 8) Feature Posts – round up the posts you love each week or month. Why does everyone love to be featured?? Features get the blogs you link to exposure. A linky party with 400 links can be overwhelming. A feature post with 5 great posts will get each of those 5 blogs great exposure to your blog audience. Maybe you don’t host a linky party? You can still feature posts you have seen through out the week or month. Don’t want to blog too often with feature posts? Consider doing features on your facebook page. 9) Blog Round Up – a post dedicated to a round up of your favorite blogs! Maybe this month you do food blogs, next month craft blogs, etc. You could do a huge round up of all the blogs you love or only feature one or two a month. A “Favorite Blog of the Month” post would bring a ton of exposure to one blog on your reading list. Exposure for them while offering your readers a blog they may never have seen otherwise. Again, this promo would be great for a facebook page! 10) ALWAYS LINK – I will end with one of the most important things you can do to help your favorite blogs. Anytime you mention another blog, link to them! The more links a blog gets on other pages, the better! So, if you are mentioning a blog in your post, take the extra time and make that text a link! Trust me — they will love ya for it! Now that I have finished this top ten list, there are a few things on this list I need to work on myself! I hope you have learned something as well! Let’s get to work promoting each other! Angie is from The Country Chic Cottage – she is a full time working wife and mother of three great kids. Angie love things that are homemade and fit into her budget. She also has a fabulous Etsy shop.